The Split-gill mushroom gets its name from how it looks when it dries out. The gills split apart from each other. Even though this is a "gilled" mushroom, it's spores are released through tiny pores. The cap is shell-shaped, with the gills coming together resembling a stem at the point of attachment. 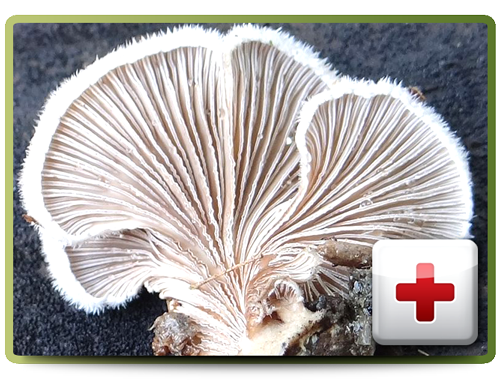 The surface of the Split-gill mushroom is hairy, tough and slippery when moist. The mushroom is grayish white and grows up to 4 centimeters across. The gills are grey or pale reddish and it's spore print is white. 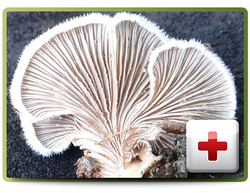 This mushroom is found on dead wood from autumn to spring in coniferous and deciduous forests.